Dr Mercola Organic Peppermint Conditioner For Dogs is an all natural dog conditioner formulated to make it easier to keep your best friend super well groomed. This premium choice of pet grooming supplies from Dr Mercola contains a blend of 7 USDA certified organic botanicals: neem seed oil and neem leaf extract - sunflower oil - aloe vera - rice bran extract - rosemary leaf extract - horsetail leaf extract - plus aromatic peppermint oil. In addition to this unique blend of botanicals, Dr Mercola Organic Peppermint Conditioner For Dogs contains organic shea butter and olive oil. These two incredible moisturizing ingredients work to revitalize and soften your dogs's skin and hair and promote a glossy, tangle free coat. The shea butter in this organic dog conditioner from Dr Mercola also works to eliminate odors. Not only is this organic dog conditioner completely free from harsh chemicals, sulfates and pyrethroids (which can be toxic to cats and should be avoided if you have cats in the household), it contains no oatmeal - a common ingredient in pet care products for dogs, but one which may aggravate more sensitive skin. Dr Mercola Organic Peppermint Conditioner For Dogs helps to keep your precious pet in tip top condition by making it easier to manage her grooming demands. It is specifically suited to keeping dogs with long hair or double coats tangle free. What's more, this dog conditioner detangler is rich in vitamins, minerals, amino acids and essential fatty acids which all play a role in promoting a beautifully glossy coat. 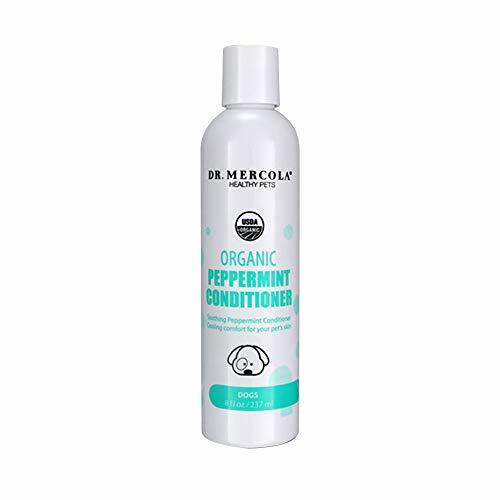 Dr Mercola Organic Peppermint Conditioner For Dogs - with its wonderfully refreshing peppermint aroma - is a premium choice of natural pet products ideal for dogs who need extra grooming or skin moisturizing. Doesn't your beloved best friend deserve the best in pet grooming supplies? Order Dr Mercola Organic Peppermint Conditioner For Dogs today and ensure your four-legged family member always looks his absolute best. ORGANIC DOG CONDITIONER - USDA certified organic ingredients, no harsh chemicals, toxic additives, or allergenic compounds. Safer, healthier, superior to alternative dog wash products, including leave in conditioner for dogs, dog soap, oatmeal dog shampoo, medicated dog conditioner, conditioning dog wipes, and deodorizing dog conditioner, all of which may contain harsh chemicals or potentially toxic, non-organic additives. Promotes a soft, wonderfully fragrant, well-conditioned coat. BLEND OF 7 PREMIUM BOTANICALS - Don't drench your friend in chemicals and toxic compounds! Our precisely formulated dog shampoo and puppy shampoo includes organic aloe vera, shea butter, neem, sunflower, and olive oils, rosemary, and horsetail leaf extract. This is an ideally formulated, organic, hypoallergenic dog conditioner, perfect for dogs with sensitive skin, aversion to chemicals, or difficulties with allergies. Easy to rinse, ideal for dogs that enjoy being bathed. SOOTHING & PLEASANT PEPPERMINT OIL - Organic peppermint essential oil penetrates your dog's coat to soothe sensitive skin and cool tired muscles, like a spa treatment for your canine friend! Peppermint is effective against stubborn dog odors, this is a great dog conditioner for smelly dogs -- you'll both enjoy the wonderful scent of refreshing peppermint. This pet conditioner for dogs is a suitable addition to your collection of dog stuff and dog grooming supplies. CONDITIONS + CLEANS - Does your dog have trouble with persistent itching, scratching, or hot spots? This is a wonderful dog conditioner for dry itchy skin -- it provides mild exfoliation to rejuvenate dry or weathered skin. This premium dog care product also promotes a luxurious and glossy coat, with a refreshing minty aroma that lasts. Use in combination with Dr. Mercola Organic Peppermint Dog Shampoo for the ultimate dog shampoo and conditioner combination. Great stuff for dogs! NATURAL + ORGANIC - Dr. Mercola has been providing high quality, organic grooming products since 2001. One (1) 8 oz bottle. Directions for use: Apply to wet coat; massage into a lather, avoiding contact with your dog's eyes or mouth (in case of contact with eyes or mouth, rinse immediately); rinse thoroughly; dry as usual. Eco-friendly, safe for rinsing in lakes and rivers. This is a safe, healthy, and cruelty-free pet care product. Made In the USA.